Has an outdoor transformation from Harbron got you dreaming? We dream the same dream – that’s the message from Harbron Home Improvements who have hit the airwaves to showcase the scope of their outdoor transformation solutions. Powerful before and after photos are also being used in associated online and print promotions with the same ‘we dream the same dream’ message – and a promise Harbron the bring your dreams to life. Company Managing Director James Harbron is confident the promotional campaign will have a powerful effect with Spring just around the corner. “It won’t be long before we are all back enjoying the beauty and versatility of our own outdoor spaces, but if yours is badly in need of a transformation, then you need to think about doing it soon,” said James. 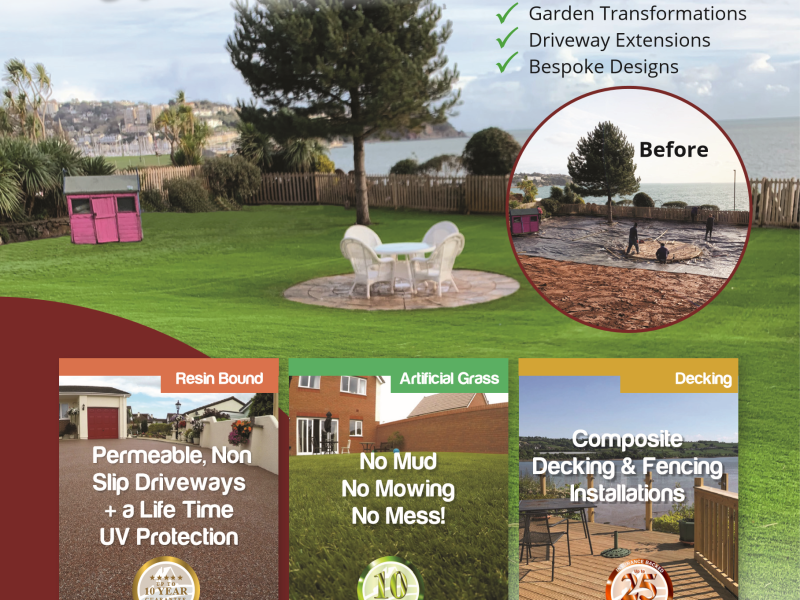 Harbron Home Improvements are established and respected specialists in garden transformation across Devon and Cornwall and into Somerset and Dorset. The company specialises in resin driveways and artificial grass, as well as composite/timber decking and complete fencing solutions, for both residential and commercial customers. It’s installation team are fully trained in fitting composite decking products from Millboard, one of the leading UK companies in the sector Millboard’s composite decking has significant edge on conventional composite products in terms of quality and durability. What makes it so special is the quality of the materials and the company’s hand moulding expertise in the manufacturing process. Unlike many composite products which are formed by extrusion techniques, Millboard’s decking is hand moulded from original timber and then hand coloured. It means far greater authenticity in terms of its wood finish. It’s tough and durable too. Most conventional deck is a combination of plastic and wood fibres, but Millboard combines mineral stone with unique resin mineral. It also means it won’t rot or warp and is free from dampness and insect infestation.